Apollo 11 is documentary in pure form. 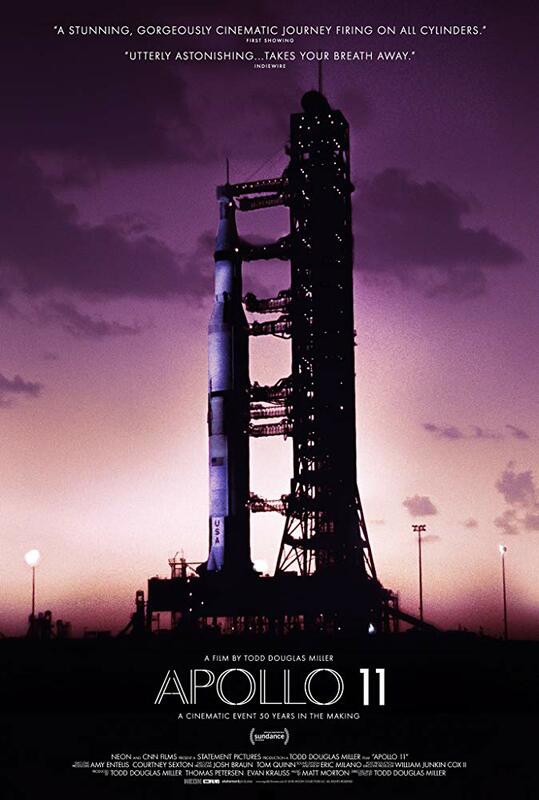 The film is assembled from the archives at NASA, contains no interviews, no interpretation by talking heads or commentary from those who were there. The spoken words are 95% those captured in the moment. And, in very simple terms, the film tells the story of Apollo 11 from about day of launch to Armstong, Aldrin and Collins finally emerging from quarantine. So... why go see this? I've said elsewhere that while I recognize Apollo 13 is a well-told dramatization of what occurred when things went poorly en route to the moon that I'd rather just watch a documentary on the topic. In the case of the Apollo missions, we have rich resources upon which to draw, we have records and living witnesses who achieved the extraordinary - and while I appreciate the art of storytelling to share what happened and make that story powerful and relevant - if you *can* do that with primary or secondary materials, that's simply my preference. And, narratively, there's no small amount of drama in spaceflight, even when we're talking unmanned rockets. Put people in a spacecraft, and then send them at the moon? And despite the fact Apollo 11 occurred fifty years ago and is maybe one of the most well-known events in our shared cultural history, watching the beats play out, one after another, is still utterly nerve-wracking. Nothing about it should have worked, it was so complicated, with so many points where anything could have gone wrong, were it not for the unbelievable effort poured into NASA and the space missions during the 1960's we would have failed. But - indeed, we put people into space with the power of math. I hadn't done much in the way of reading up on the film before heading to see it, but I got my times wrong, and so we had some extra time hanging with our resident NASA-nerd, JuanD, who explained that the film contains footage originally intended to be used by MGM to create a film, and thus shot in 65mm, but which was never processed or used - just sitting in an archive. So, yeah, here in 2019 we're able to see remarkable new film originally in 65mm (in IMAX at some locations) - capturing the launch, the pads, and so much more. Hell, the hots of the staff at NASA were so good, so brilliantly captured - bringing the worried hopes and dreams of the hundreds of NASA and related staff alive. No amount of swelling score or movie-managed moments can quite get the reality of what happened, and to so many. A curious detail of the film is seeing the seas of people who came out for the launches - people as they were, not actors in tailored costumes. A celebrity sighting of two in the film doesn't distract from the reality of everyday people caught up in the dream of Apollo 11. And, of course, it's hard not to notice how overwhelmingly White the proceedings are - with few POC seen in crowd shots and none as featured people. And, yes, at the pre-launch briefing, we see exactly one woman sitting in the briefing, dressed to the 9's and killing it, but only one woman (I would love to know who that is). This movie will be good on TV when it eventually makes its way there - maybe in time for the anniversary. This *is* a CNN Film, and I wouldn't be surprised if it was aired on CNN in July. But - this movie needs to be seen on the big screen as much as any Avengers extravaganza. So go do it.